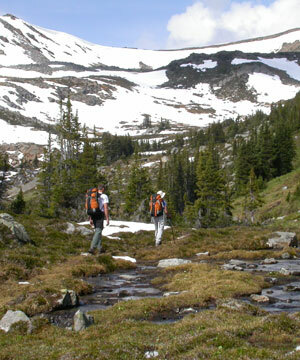 Hiking in the Esplanade Range is intermediate to advanced. This is the true wilderness, where "trails" are unsigned and there is scree and rock that will be encountered on long hikes. Hike or just HANG OUT. There is equally good hiking potential from all three lodges. 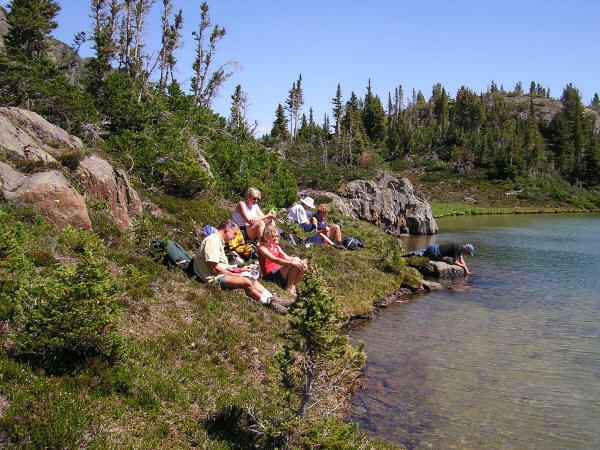 Each accesses pristine alpine meadows and lakes right out the door, and also longer ridge walks and summit hikes. If you are planning a one lodge stay, we recommend either Vista or Sunrise Lodge. 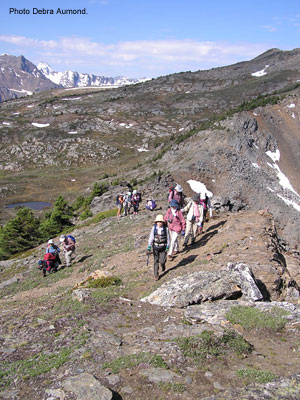 Sunrise Lodge has the Mayville Valley, as a special hiking destination. This intricate and beautiful basin is filled with numerous babbling brooks, tarns, and lakes. Wildflowers are abundant. A series of classic ridge walks and scrambles are also available from this lodge. 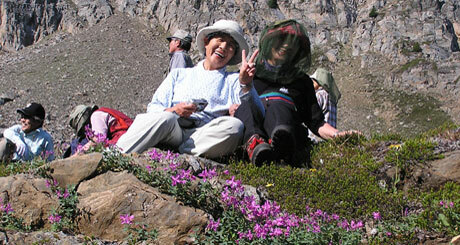 Meadow Lodge boasts the quickest access, to the Esplanade Range's highest peak, Cupola Mountain. 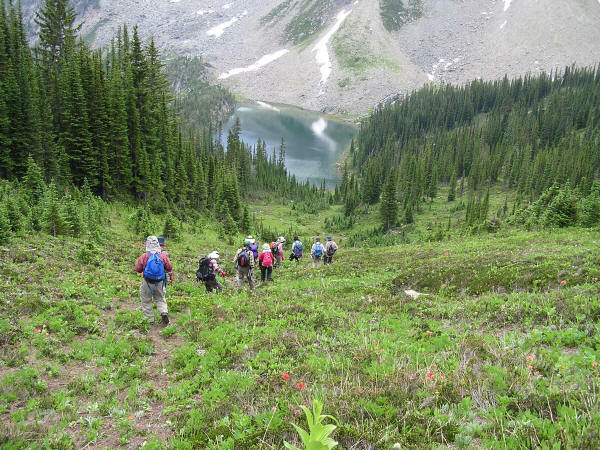 Unparalleled views from this spectacular summit scan the breadth of the Rocky, Purcell, and Selkirk Mountains. Accessed right from the lodge door are extensive rolling alpine meadows, creeks, and lakes. These are just some of the captivating features of the Meadow Basin. Vista is the lodge of many options. Long exploratory hikes offer travel through the large, rolling and flower filled Colpetti Basin to the north, and into the wilder terrain of Cupola Creek headwaters, to the west. Trundle Peak is a classic ridge walk with a fine summit, and Vista Peak is for those who like to take on rougher scrambling for a worthy summit. A beautiful alpine lake rests just 30 steps from the lodge door. The elevation of the lodges is 7000' (treeline). Golden is at 2500' - the Columbia Valley bottom. You will be flying by helicopter from this elevation. 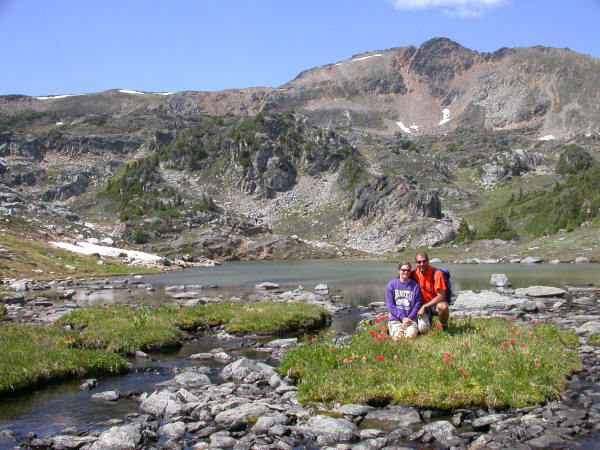 Most of the hiking is done from lodge elevation and above, thus you will spend most of your time between 7000 and 8000', with the higher hiking peaks up to 8700'. 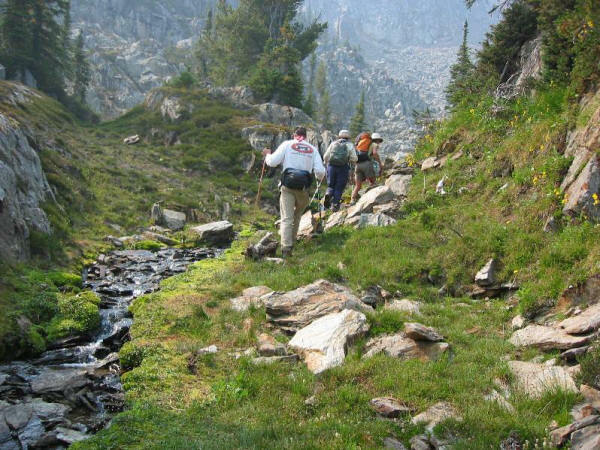 Some hiking is available below the lodge elevation down to 6400', however there tend to be more bugs and bears in this sub-alpine region. 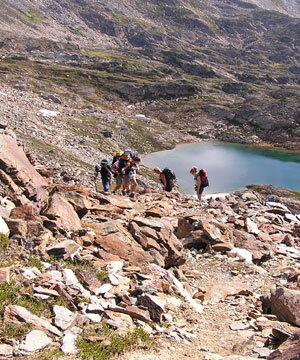 The traverse between lodges is 7 to 8 hiking kms long, with an elevation gain and loss of around 1800 vertical feet. If you have chosen to traverse between one or two of the lodges, you will be using the standard trail that crosses a variety of terrain. If you choose to traverse between lodges, reasonable fitness is required. This coupled with a sense of adventure and a decent pair of hiking boots, will enable you to have a wonderful true wilderness adventure in this fantastic hiking terrain. 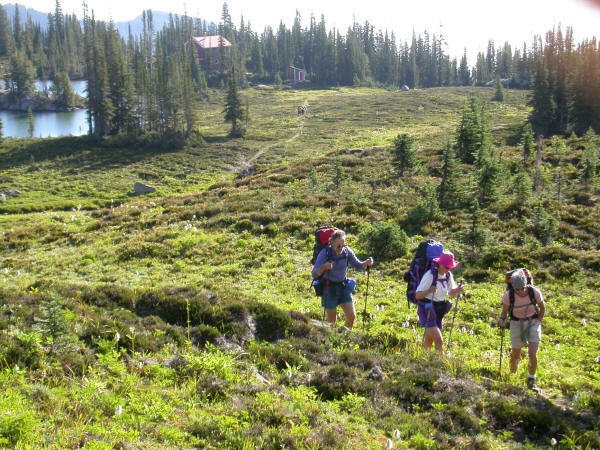 If you have chosen a self-guided package, you need to have a solid background in route finding, map reading, compass skills, and the necessary gear and knowledge to look after yourself in the wilderness environment. "Off Trail" at our means, there is no path, and no signage. You will have to cross rocky zones on slopes of varying steepness. The rock is a mix of shale and scree interspersed with sections of large boulders. These rocky areas are most common on the upper ridges of the scrambling peaks. They can sometimes be avoided dependent on your objective. Alpine meadows can be "lumpy" with undulating and irregular footing and slopes of varying steepness. There are minimal creek crossings in the Esplanade. Most creeks are small and easily stepped across. 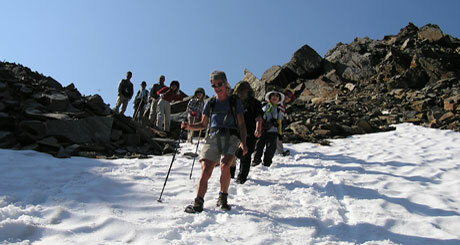 Significant areas of old winter snow can be encountered, mostly on the July trips. Old snow areas can pose hazards like slipping, sliding, and breaking through unexpectedly. Summer storms can bring in new snow in any month, though it doesn't usually lie for long. The vegetation is a mix of heather, grasses (sedges), wildflowers, mosses, and lichens. Sub-alpine fir and pines surround the lodges. 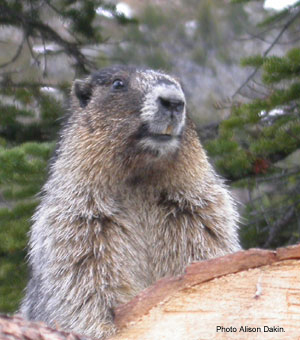 Grizzlies, mountain goats, wolverine, marmot, weasels, caribou, share the area with a variety of smaller rodents, raptors, ptarmigans, and other birds.